This yummy dairy-free recipe has become a favourite of ours at Anahata Yoga Retreat. It was introduced to us by a lovely German lady living here. In her family it is a must have in winter before Christmas. 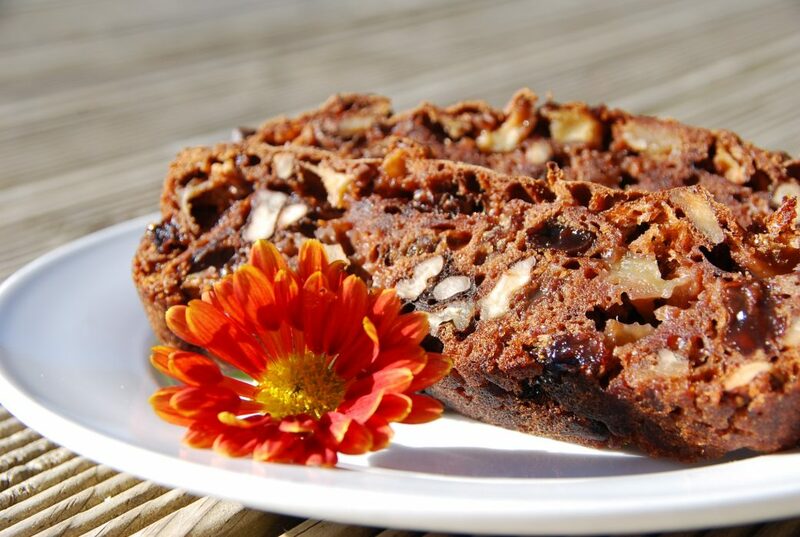 It is known as “Apfelbrot”, which translates to apple bread, and is often eaten as a sweet treat in autumn or winter because of the hearty and grounding flavours of the spices and nuts used. The loaf can keep for a few weeks so is a useful thing to have in store when friends come around unexpected. Peel and chop the apples into cubes. Mix in the sugar, cover, and leave to soak overnight. This brings out the liquid in the apples. When ready to bake add all the remaining ingredients and mix well. Bake in the oven at 200˚C for 70 – 90 minutes. Don’t worry if the top of the loaf becomes quite dark. It is good to have it a little crunchy. This loaf makes a yummy treat with a spicy warming tea or as a sweet breakfast.